This is a wonderful fantasy novel, translated from the Finnish. The island of The Red Abbey, in which only women may step, is steeped in tradition. Beautifully written, this is a rich coming of age story with real depth. You can read more about the book here. Maria Turtschanino has been writing fairy tales since the age of five. She has been awarded the Finlandia Junior Prize, the Swedish YLE Literature Prize, and the Society of Swedish Literature Prize, the latter on two occasions. She has also been nominated for the Astrid Lindgren Memorial Award. Turtschanino has a Master of Arts in human ecology and works full-time as a writer. She lives in Finland. “The novel is at once contemporary and timeless. Its unwavering feminism is resolutely modern, resonating with a range of texts from Ursula Le Guin’s 2001 Tales from Earthsea to Disney’s Frozen. At the same time, it feels authentically ancient and mythic." "It's hard not to be impressed with Turtschaninoff's magical world." 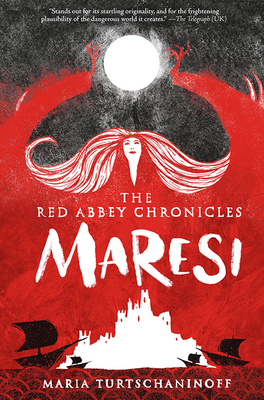 "'Where YA fantasy can start to feel a little same-y, Maresi stands out for its startling originality, and for the frightening plausibility of the dangerous world it creates." "Utterly satisfying and completely different from standard YA fantasy, this Finnish import seems primed to win over American readers." father and the Sisters. But what’s more impressive about this fantasy is the subtlety with which the serenity of the island and its way of life is established—through the calls of birds, the sounds of the lapping sea, the smoothness of driftwood." "Readers seeking a fresh, unusual fantasy setting and voice will likely appreciate this haunting literary detour."